Sometime back in November, I morphed into a 15 year old on the cusp of full blown puberty. Or at least my face did. When I was a teen, I had the occasional pimple or zit and maybe a few blackheads on my nose area. I never had a problem with my complexion–I was actually pretty lucky. Then, when I went back to KY back in November, I went from having the occasional, troublesome spot to a pimple party on my forehead. It was bumpy. It was itchy. There were lots of little whiteheads everywhere. I now had an oil slick on my face. It was gross and made me really self conscious. I put it off to being in KY and washing in different water–that can sometimes do it. We’re now at the end of January and this breakout is still going. I’ve tried everything. Cheap face washes and moisturisers as well as their (very) expensive counterparts. Somehow, it’s tapered off slightly but I’m nowhere near in the clear. Ha, pun intended. 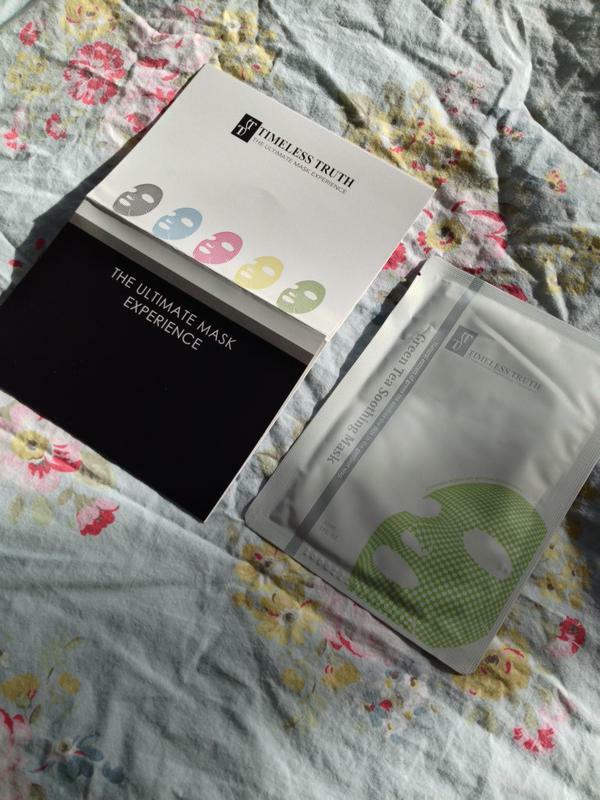 I felt like both my face and I were in need of a little treat so I jumped at the chance to try out Timeless Truth’s Green Tea Phenol Soothing Facial Sheet Mask. 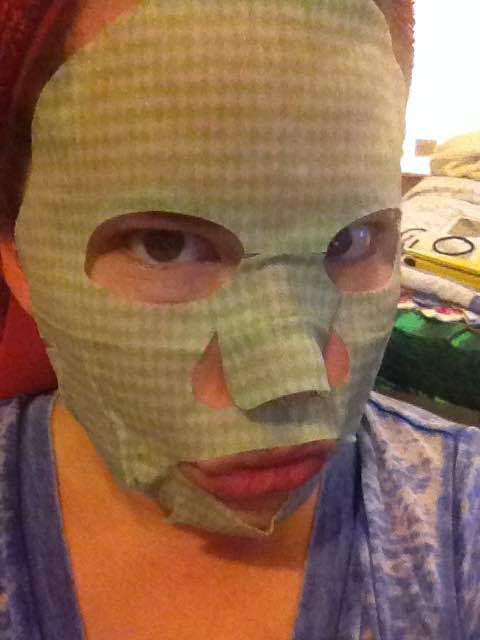 I’ve seen sheet masks before but never tried one myself. I’m not a hugely girly girl so only put on a face mask on the very odd occasion. Anyhow, it looked interesting and sounded like it might be just the thing for my poor skin. The Green Tea Phenol Mask contains a thin cloth soaked in a serum that’s a mixture of green tea (antioxidant), hyaluronic acid (moisture enhancer), aloe vera extract (soothing and encourages cell growth) and chamomile (acne and irritant reduction). With holes cut for the eyes, nose and mouth, the mask is easy to put on though I do think I look a bit like Leatherface! So I have to admit that actually wearing the mask is a bit odd but after a few minutes you kind of get used to it. I was paranoid for a while, thinking that with all the lovely serum in the mask it would just slip right off my face and slide down. Wrong! It did stay put and my husband got to make fun of me properly the whole time. The serum itself was lovely–very lightly scented and not at all unpleasing. The masks are very generous with their serum. So generous, in fact, that there was quite a lot leftover in the pouch which I happily smoothed onto my under eye area, my neck and décolletage (fancy word for upper chest/collarbone area). The instructions say you can either put the mask in the fridge for a more refreshing experience or place in a bowl of warm water for a more pampering experience. I left it at room temperature as it was too tough to decide. After 20 minutes of kicking back and relaxing, it was time to take the mask off. Super easy, folks–you just peel it off. It doesn’t cling to your skin and hurt like ripping off a bandage or anything like that. Thank goodness… because who likes that? So what was my skin like afterwards? Well, I wasn’t expecting miracles given my current skin situation. There’s no such thing as a miracle acne remover (oh how I wish) so I totally didn’t think that was even in the realm of possibility. And it didn’t cure my acne…. but my skin was noticeably fresher and calmer. The redness of my spots was almost non-existent and, even now at a few days on, the redness has still been kept at bay. I’d say that’s a win. With all of that said, I would definitely use Timeless Truth’s masks again. If you’re interested in trying our a mask for yourself, Timeless Truth has quite a nice variety of masks available to order from their website. I myself would like to try out the charcoal based mask which says it’s good for people with congested skin or people who live in highly polluted areas. Can I get an amen, London? Masks range in price from £4.95 per mask on up and they do also have 5-packs available. I think you might be my first ever reblog!!! Thanks, bb! Omg yay!! You reminded me I have one to try out too haha 😀 your review was so well-written, as usual!